I always tread cautiously when my blog attracts requests for book reviews. 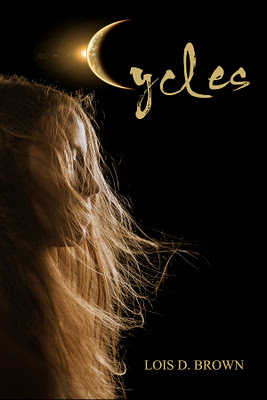 I see a wide range of talent and professionalism, but Cycles, by Lois D. Brown, I am pleased to say, rates among the best stories I’ve received. Within, an accident leaves13-year-old Renee Beaumont’s life completely shaken. Not only does she narrowly escape death, but doctors in the hospital identify abnormalities in her blood. Abnormalities that lead to questions concerning her parentage. Abnormalities that may be linked to an increasing number of dizzy spells and memories that cannot possibly be her own. Abnormalities that prompt the sudden interest of individuals who do not have Renee’s best interest at heart. Abnormalities that push Renee, along with her best friend Sam, on a wild ride of discovery that lands them smack in the center of a most peculiar blending of science and legend. I have lots of good things to say about the story’s mechanics. Intrigue begins right away. The opening chapters create a host of questions that are skillfully unraveled throughout the remainder of the story. A deadly horse epidemic, Renee’s habit of drawing spirals, Sam’s father’s death, solar eclipses–all these details come back around to tuck nicely into the story later on. The plot is original, engaging and creative. There is a measure of predictability, but I think the kids for whom the book is intended (12-16) will enjoy figuring out the clues artfully planted along the way. And in all fairness, there were elements I didn’t foresee. As to Ms. Brown’s writing, it’s very nice. There are moments it doesn’t read as smoothly as a title with a whole publishing team behind it, but I was very pleased with the overall effect. She creates some wonderfully descriptive word pictures, often in tandem with bright humor. For example, “Dawson cleared his throat again. He was either allergic to the hospital’s disinfectant spray, or he was nervous.” The title, too, is wonderfully metaphorical and clever. The characters, as is often the case with contemporary teen fiction, feel a bit cliche. Rich girl with parents that ignore her. Geeky guy with a crush on a cheerleader. But they are given quirks that make them feel realistic and warmth that wins a reader over. Gamma Didi, on the other hand, is hugely original. An old Indian woman with gentle wisdom, odd habits, tribal memories, and modern intelligence, she’s the perfect counterpoint to the teens. Indeed, she’s the character that jumped off the page and became my favorite. I would rate this book easily appropriate for kids 10 and older. Romance is kept sweet and innocent, language is perfectly clean. There is some violence at the end, but it isn’t graphic or overwhelming. There is an element of spiritualism–souls of the departed watching out for the living and the mention of a seance–but it’s very background, and a bit of mysticism is necessary for the story’s magical elements. Ms. Brown nicely blends legend with science. I enjoyed Cycles a great deal, and I’m happily putting out my recommendation. Besides, with a 2.99 price tag, you can’t afford to pass it up! Visit Ms. Brown’s author website and her blog, Life of Lois. Tomorrow: 5-Q Interview with Cycles author Lois D. Brown. Great review! I’ve never heard of this one 🙂 I like your “bargain book” picks! Does the story have one big mystery or a lot of small ones? Is it mostly about Renee’s “abnormalities” and discoveing them? This one is brand new, and it’s really good! It’s one big adventure, Renee learning exactly why these wierd things are happening to her. The reason is…WOW! A fun read!